Ibrahim Alabidun | K. K. Eleja & Co.
Mr. Alabidun graduated from the Faculty of Law, University of Ilorin, Ilorin in the year 2010 where he bagged his LL.B degree with Second Class Honours, Upper Division. 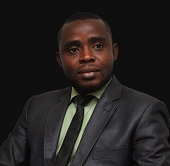 He was later called to the Nigerian Bar in January 2012 after he had successfully completed the vocational course to become a Legal Practitioner at the Nigerian Law School. Alabidun has since been engaged in Litigation, having his National Youth Service Corps programme at the Ministry of Justice, Osun State in 2012 on the completion of which he joined Messrs K.K. Eleja & CO.
University of Ilorin Alumni Association.